A few weeks ago, I would never have thought that I would ever be excited about walls, or proud of a wall for that matter! 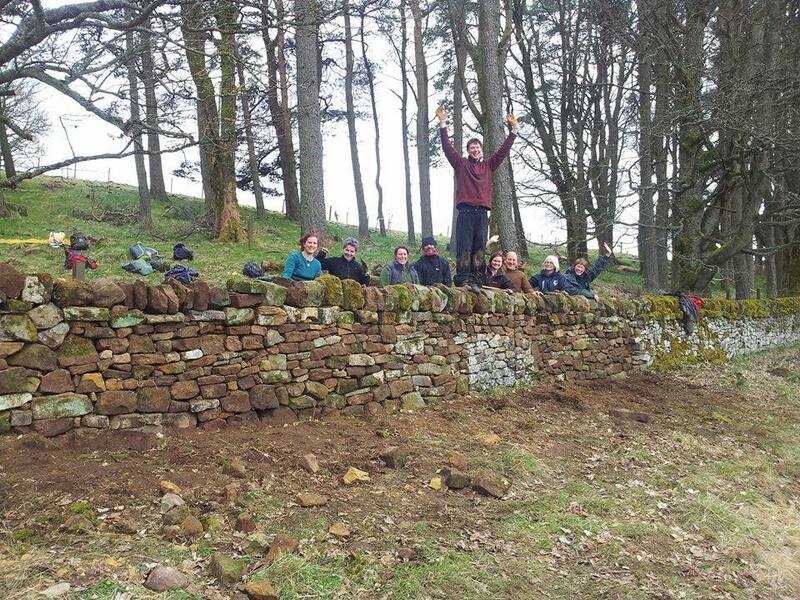 But this month I signed up to one of TCV’s courses in Drystone Walling, or dry stone dyking as it’s known in Scotland, and I have to say, I am now very excited by walls…. 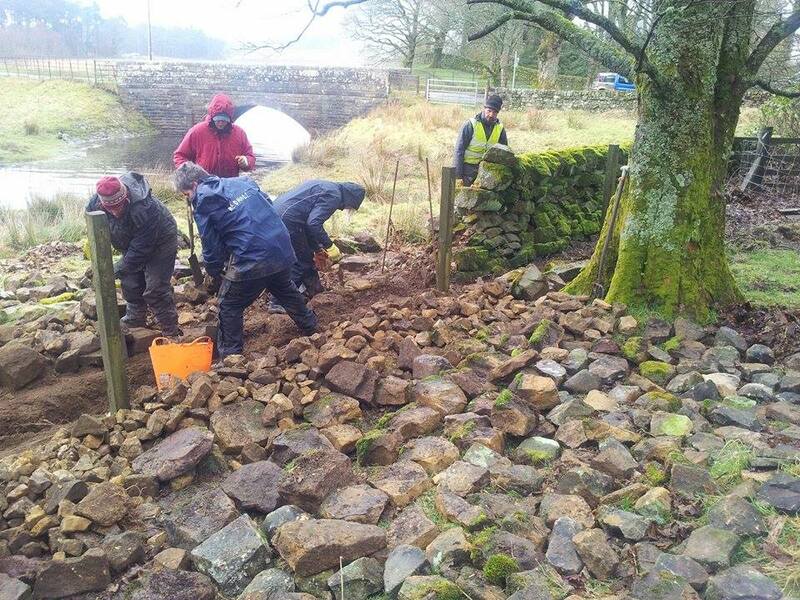 Peter Holmes is a rural skills instructor who teaches all sorts of courses from walling to hedge laying to live willow sculpting, and it was Pete who emerged through the wind and rain at Harperrig reservoir to teach us how to wall. 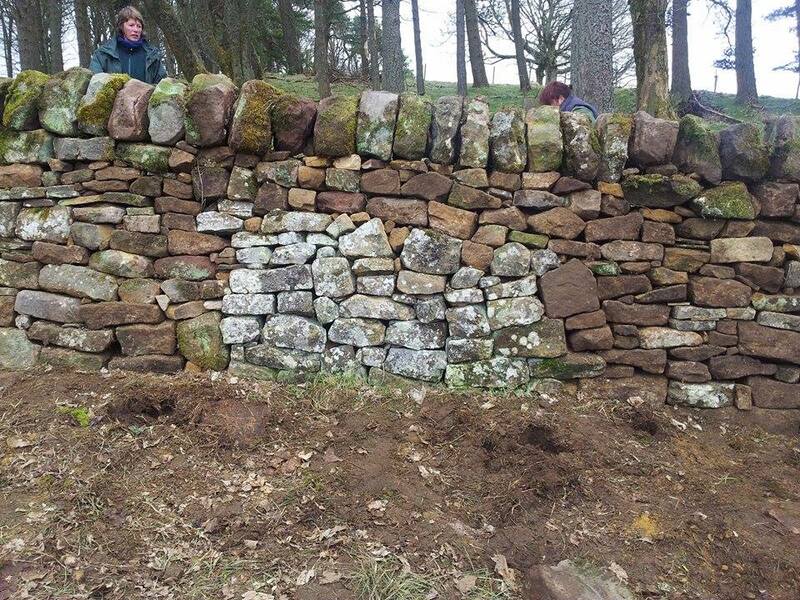 I originally signed up to the course because I am a massive geek and I wanted to learn more about dry stone walls as a wildlife habitat. Most of the dry stone walls we see in fields, woodlands and moors can be one hundred to three hundred years old and these ancient constructions provide fantastic opportunities for wildlife and act like a corridor for animals to move from place to place. They are filled with lovely things like mice, bugs, moss, and you guessed it, my newly discovered one true love; lichen. 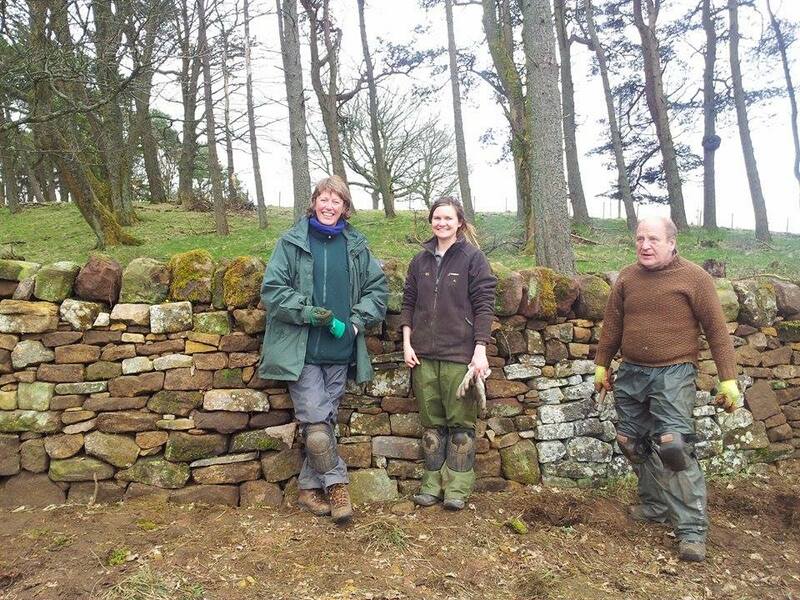 Me and fellow trainee Sue with our wall, and my uncle Jim from Edinburgh who came along! Small World! As we began building, I was struck by how therapeutic the process was. It was like a giant jigsaw puzzle and it was extremely satisfying when you found the perfect stone to fit with another. 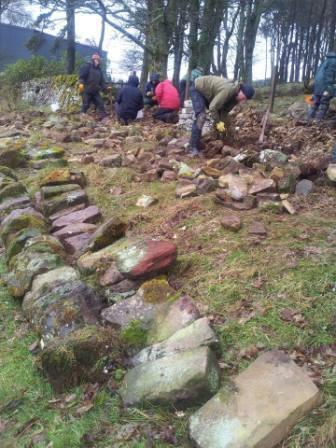 We were repairing a wall that had come down due to the marvellous weather we get here in Scotland. As we pulled out the stones to re-position them I couldn’t help but wonder who had built the wall before us and how long it was since some of these stones had seen day light. I think building walls could be a new activity used in those hippy mindfulness sessions! It gave my mind something to focus on and I soon forgot the weather and any worries, I was completely engrossed in the wall! Watching Pete I could see that he had really mastered an ancient craft and it was amazing to help him build a new wall that will hopefully stand for another hundred years, creating a nest site and cover for birds and little beasts for years to come. And maybe in a hundred years, someone else will wonder who built the wall that we built. But of course I haven’t just been continuously building walls for a whole month! I also took a trip to Perth to go to the Scottish Dragonfly Conference where there were lots of groovy talks about dragonflies. Pat Batty gave a brilliant presentation about her studies into how the potential reintroduction of beavers to Scotland could affect dragonfly species. Overall it looked like they would have a positive affect! Hurray! Re-wilding! TCV offered up another excellent course this month along with the OPAL Community Scientists to offer people the chance to be accredited Opal Survey leaders. This was a great opportunity to really get to grips with the eight surveys OPAL offers and how to use them to help people connect to nature. It was two amazingly informative days that included bug hunting, digging, and pond dipping. I could have stayed and played all week! 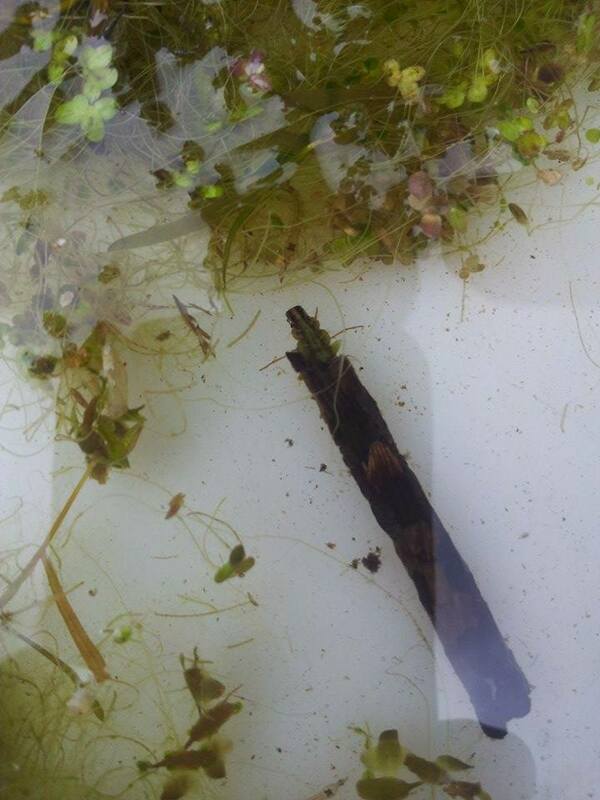 I was really excited to find some amazing cased caddis fly larvae! Such amazing alien like creatures!! They glue together bits of pond debris with their saliva to build a little case for themselves! 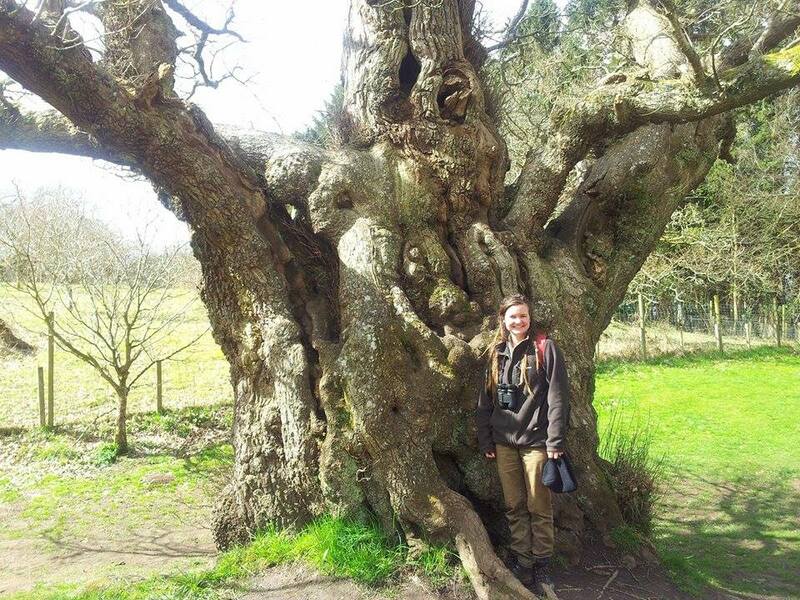 I particularly liked the Tree Health Survey as it gave me lots of ideas on how to help people understand that trees are more than just big plants in the background, that they are living breathing organisms that struggle with diseases and surviving just like we do. 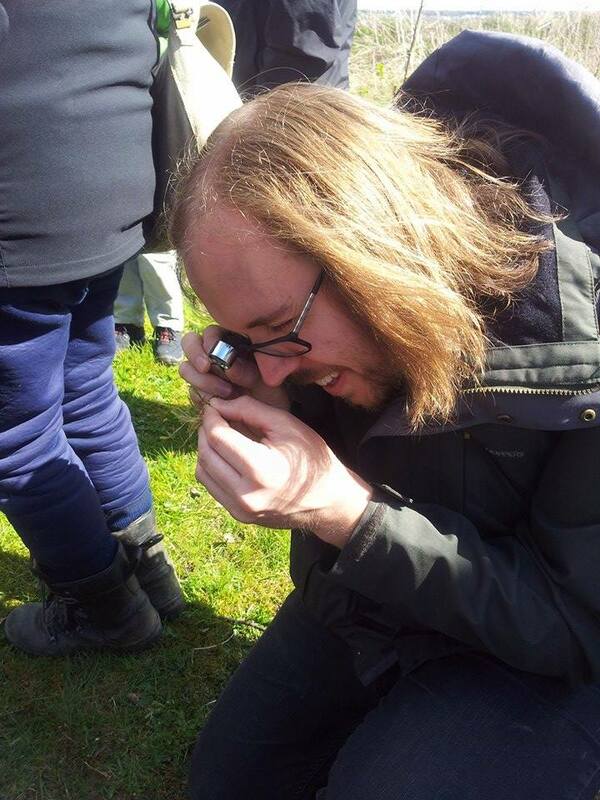 Fellow trainee Stephen enjoying some moss! I am hoping to use some of this new knowledge and skills soon as I am currently planning my first event. 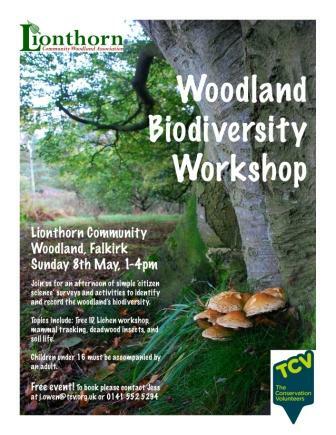 As part of Falkirk Nature-fest I am running a Woodland Biodiversity Workshop on Sunday the 8th of May at Lionthorn Community Woodland in Falkirk from 1-4pm. Everyone is welcome to join and we will be teaching participants all about woodland life through Citizen Science surveys and activities. I am really excited to finally deliver my first workshop with some fellow trainees, if a bit scared! I just can’t wait to help people learn about how epic trees and woodlands are! me and a giant tree!